Urban Intellectuals provides positive Black history, & culture. Our motto is Black Excellence Over Ignorance. We create meaningful, engaging, and relevant discussions among the African diaspora by providing engaging, educational content & products. Check out these amazing Black History Flash Cards, designed to combat the miseducation and suppression of Black achievements around the globe. Enjoy learning about the revolutionary contributions of our people. Take pleasure in sharing all that you learn with friends, educators, and most importantly, our youth. It is imperative that they understand Black history, become inspired, and take action to build their own greatness! The photo, name and dates of the person is on the front and an explanation about their life is on the back, in easy to digest bullet points. This volume’s 52 cards give a strong foundation of the many untold stories, achievements, and unknown people that have given shape, color, and definition to the worlds of academia, science, civil rights, business, the arts, and more. Volume 2 is a 52 cards set that focuses on amazing Black women in history, different from the ones featured in Volume 1. 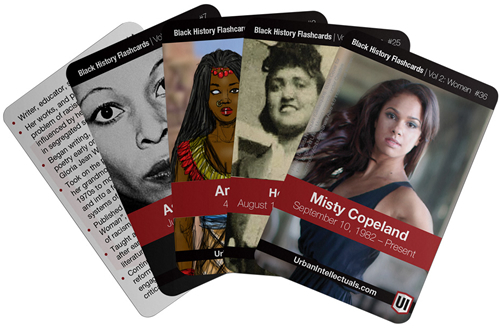 Each card features Black women and events that are important to Black history. The amazing stories of these Sisters are sure to educate and inspire you! Get these amazing cards for your family and learn the true, great history of the Black race.